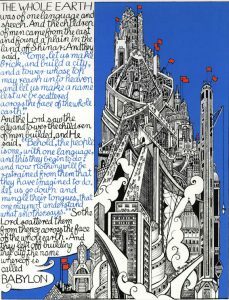 Two signed, limited-edition prints by Scottish artist, writer and cultural icon Alasdair Gray have just been acquired by The National Library of Scotland. 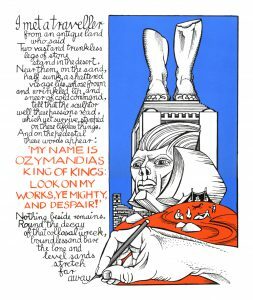 Ozymandias and Tower of Babel were published by the Glasgow Print Studio for an exhibition at the Saltire Society’s offices in April 2017. The exhibition launched a new bursary in Gray’s name for emerging Scottish creative talent, and it is in the same egalitarian spirit that the artist wishes the Library’s collection of his literary artwork to be as complete as possible, and publicly available. These recent works are a special and important addition to our collections which include the Alasdair Gray Archive. The Archive’s print and manuscript material provides fascinating glimpses into the life and creative processes of one of Scotland’s foremost writers and artists. A signature trait of Alasdair Gray has been to combine extracts of his own words – or those of his literary influences – with his art. The physical beauty and layout of his books are as significant considerations as the themes and words contained, and Gray’s self-designed publications demonstrate an aesthetic freedom in their ambitious layout and design. As a youngster, the artist was an enthusiastic user of libraries and the visual literary devices of the authors he read including Rudyard Kipling, Lewis Carroll and Hans Christian Anderson have inspired the form of his many publications. A book of poems, Old Negatives, A Life in Four Verse Sequences (Jonathan Cape: 1989) for example, uses four illustrations adapted from designs that Gray originally began as a project in the sixties that aspired to emulate William Blake’s Songs of Innocence and Experience. As with Blake, the effect is art in print; words combine with images, working co-dependently as part of the same creation. The images used in Gray’s new screen-prints are re-workings of illustrations from the two Axeltree stories in his collection of fantastical short stories Unlikely Stories, Mostly (Canongate: 1984) which uses several, experimental book-making techniques. For Unlikely Stories, the images appeared in black and white. For the revisions, Gray has coloured them radical blue and red. 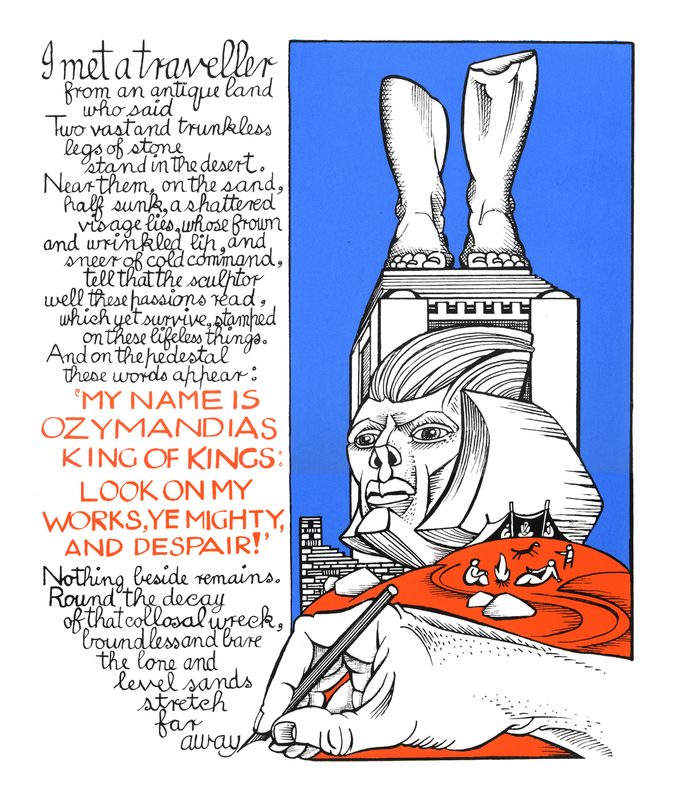 Ozymandias takes as its source Percy Bysshe Shelley’s sonnet on the perils of vanity (transcribed here by the hand depicted beneath the titular king’s ruined effigy) and fuses it with the original book illustration. Similarly, Gray’s image for Tower of Babel illuminates the passage from the Book of Genesis that morally condemns the hubris of the Biblical people who dared to build the ancient Mesopotamian kingdom. The lasting influence of European Renaissance artists such as Breugel and Albrecht Dürer on Gray is apparent though given the works follow his serious injury in the summer of 2015, there may be a more poignant conceit. While the prints foreground Gray’s interest in classical myth, they could arguably be rooted in reality as prescient meditations on political flux or the transcendence of the mind over corporeal existence. The acquisition of the screen prints by the National Library of Scotland is particularly significant to the artist as it ensures their accessibility to the public. As Kevin Brown, Curator of the Coningsby Gallery’s 2017 summer exhibition Alasdair Gray’s Life in Pictures explained to the Library, this means the prints “become social assets rather than collectors’ items”. The sentiment mimics the Socialist function of print-making and mural painting as media for public consumption. Much of Gray’s work appears in public collections as well as on murals at venues around Glasgow’s west end. Even the original Cowcaddens panorama, one of Gray’s most famous works, currently hangs in Riddrie Public Library where the germination of his art first took root. In this long tradition, the conservation and display of the prints at the National Library will ensure their appreciation by Scotland’s readers for years to come. Search the Library catalogue for books by or about Alasdair Gray. 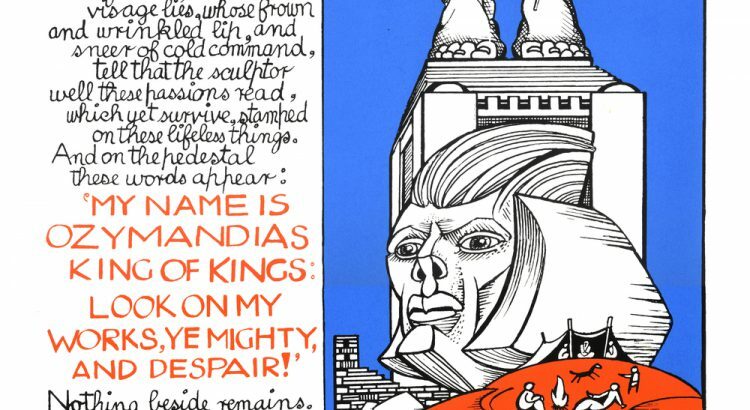 Visit the Moving Image Archive to find films inspired by, featuring or about Alasdair Gray. The images above are reproduced with the kind permission of the artist. 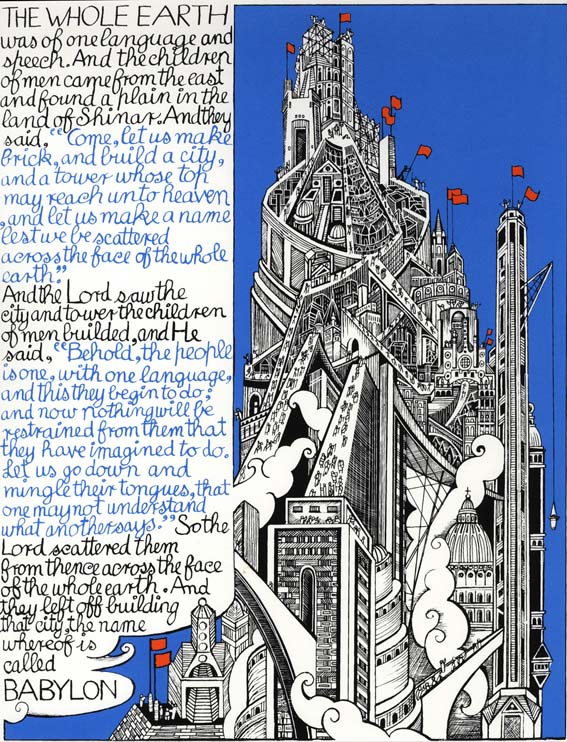 A selection of his works can be viewed on the official website of Alasdair Gray.